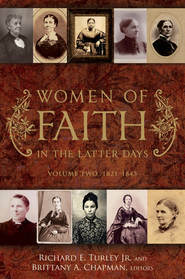 Eliza R. Snow is one of the most revered women in the history of The Church of Jesus Christ of Latter-day Saints. We hear stories of her faith and strength, and we sing her beloved hymns. She was fondly known as "Zion's Poetess" and also as "Presidentess," because of her leadership of Relief Society and her role in forming and directing organizations for young women and children. She has remained a legend for generations of Latter-day Saints, but we know less about her "variegated life," as she described it—the personal joys and sorrows brought about by unfolding events in the young Church of which she was a part. This intimate look at Eliza R. Snow, by authors Karen Lynn Davidson and Jill Mulvay Derr, reveals a more private side of this extraordinary woman. She emerges as a bright young poet in Ohio, a new convert to the restored Church, a seamstress, and a sharer in the persecutions and hardships of the early Saints. We see a member of the households of Joseph Smith and Brigham Young, a dedicated temple worker, and a traveling Relief Society president with a zeal for teaching the gospel. Her delight in nature, her love for family and friends, and her outlook of hope for the cause of Zion are reflected here through selections from some of her best poems. 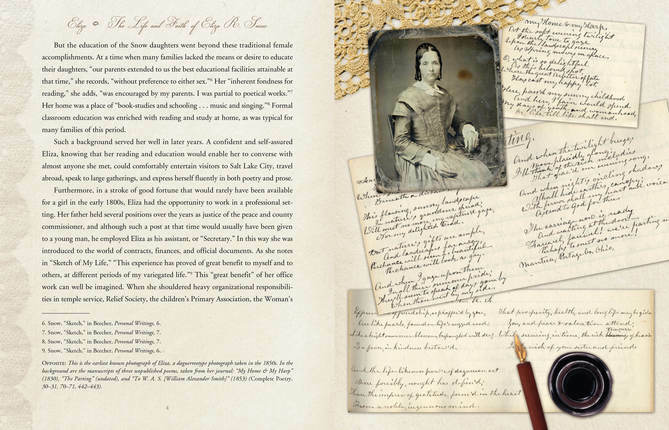 Photographs, artifacts, and personal letters add visual beauty to this inspiring introduction to her fascinating life. Karen Lynn Davidson earned a Ph.D. from the University of Southern California. At Brigham Young University she was a member of the English faculty and director of the Honors Program. She has served on the General Music Committee of the Church and plays violin with the Orchestra at Temple Square. She is the author of the popular classic Our Latter-day Hymns: The Stories and the Messages and coeditor of the Histories volumes of The Joseph Smith Papers series. JILL MULVAY DERR holds an M.A.T. from Harvard University. She was a research historian at the Church History Department in Salt Lake City and at Brigham Young University, where she was also an associate professor of Church history. 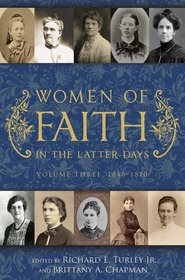 She is coauthor of Women of Covenant: The Story of Relief Society and coeditor of Women's Voices: An Untold History of the Latter-day Saints. 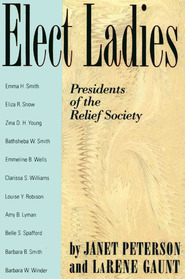 Her many other publications include more than a dozen articles on the life and thought of Eliza R. Snow. Eliza Roxcy Snow is one of the best known LDS woman pioneers. She's known as Zion's Poetess because of her beautiful poetry. One of the most amazing things about her is that she was well educated in a time when women really weren't educated, it was just something that was important to her and to her parents for her to be educated. That allowed her to work as a teacher first in Kirtland, later in Nauvoo and Salt Lake City. This allowed her to be a surrogate mother to many children when she was unable to have children of her own. I'm sure it was a great comfort to her in her childless years to be able to be around and influencing so many youngsters. I have always had a special place in my heart for Eliza, but never more so than after our trip to Nauvoo last summer. Eliza was depicted in the pageant that the LDS Church puts on in Nauvoo very prominently. I love that she's one of the main characters. The young lady who played her last year was just amazing too! She brought me a whole new appreciation of this wonderful woman, as did reading this book about her! Eliza R. Snow is probably best known for the popular hymn "O My Father" and her role in the early Relief Society organization but by studying her life and her writings I gained insight into one of the best known Mormon pioneer women and discovered that she did so much more! Filled with photographs, paintings and her original poems, both published and unpublished, this book is inspiring. 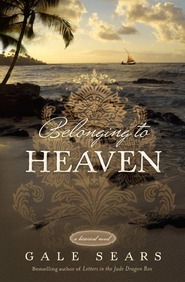 Eliza R. Snow's writings share what it is like to lose a loved one, celebrate friendship, suffer hardships, deal with injustice, encourage patriotism and especially gain a strong testimony of our Heavenly Father. I had no idea that she has written so many amazing poems (over 500 according to the author). 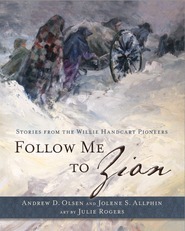 The book walks you through Eliza's early life including her touching conversion story. 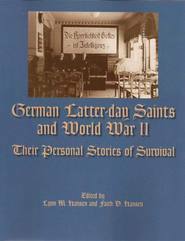 Through each chapter you can follow the growth and expansion of the church and the ultimate arrival in the great Salt Lake Valley with the early Saints. Each milestone is documented beautifully through Eliza R. Snows descriptive poetry. You will feel a greater love and understanding for Eliza! You will rejoice in her life! You will treasure the legacy she left for us to follow! "O Lord my God I pray...that I may be useful." The layout of the book is much like 'Daughters of My Kingdom', every page is a work of art. No matter what this woman went through, she always kept a positive attitude. She was married and sealed to Joseph Smith. After Joseph's death she was married for time to Brigham Young (mainly for protection and support, she never lived as a 'wife' to either of her husbands). 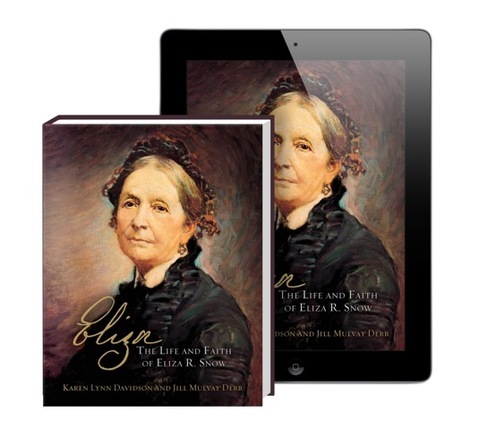 Eliza wrote 500 poems and many hymns, crossed the plains in near poverty, helped re-establish ward Relief Society's, helped organize the Young Ladies Retrenchment Society and the Primary Association, worked in the Endowment House and St. George Temple, traveled to Europe and Palestine, and served as general president of the Relief Society at age 76. She was a patriot, supporter of plural marriage and a supporter of women's suffrage. In her almost 84 years she accomplished so much. A very remarkable woman! As a lifetime member of the Church of Jesus Christ of Latter-day Saints I confess I did not know much about Eliza R. Snow before picking up this book. I had heard her name and seen her portrait but the innermost thoughts of her heart were a mystery to me. After reading Eliza I feel I have grown to love her and revere her as an example of strength, fortitude and faith. Eliza R. Snow was born to a New England family with strong revolutionary War roots. Her father was respected in his civic and business spheres and he often took Eliza with him to work alongside him in his duties. From a young age she was exposed to a world many women of her time never saw. Through the encouragement of her parents, she sought an education and developed a love of writing poetry which later flourished until she came to be known as "Zion's poetess." 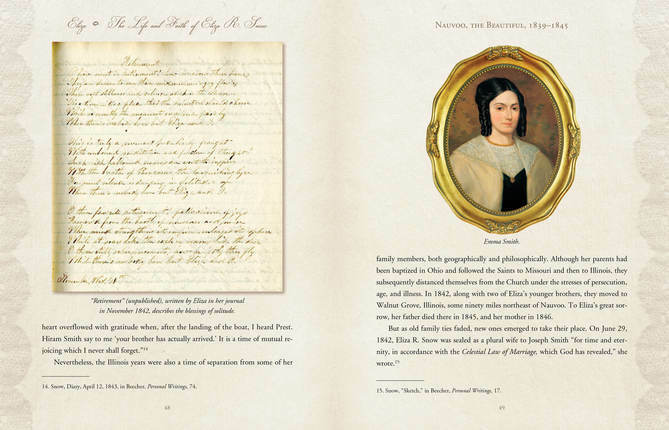 She left behind so much of what she loved in her childhood home of Mantua, Ohio to follow the prophet Joseph Smith- later to become his wife before the martyrdom. Then, once again she picked up her things and traveled West with the Saints making her way to Utah with Brigham Young as one of his wives. Eliza was instrumental is organizing and leading the women, youth and children of the church as well as devoting much of her time in the endowment house doing Temple work. She was stalwart, encouraging and uplifting-- often penning personal letters and verse to those she loved. 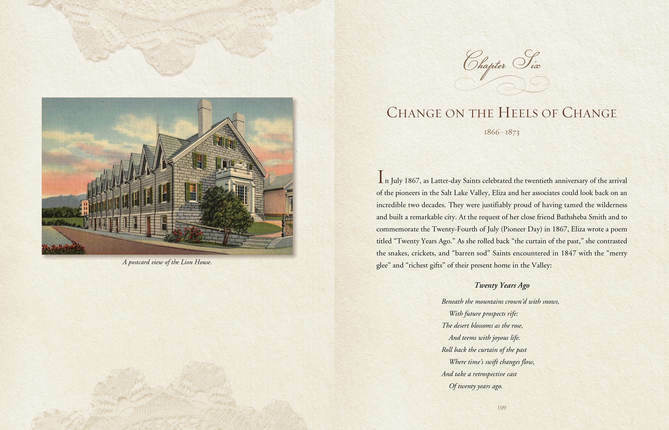 This book is a multi-media, gift quality collection of handwritten poems, antique cabinet card photos and historical documents. It gives the reader a taste of what it was like to step into each period of Eliza's long life. Many of the pages are filled with the hymns and poems that we have come to love including one of my favorites "Oh My Father." I even found one of my ancestors, German Ellsworth listed in a musical program copy tying my family roots to Eliza's story. 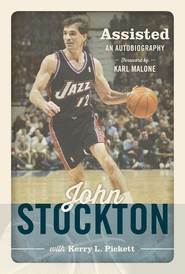 I would whole heartedly recommend this book and it is a treasure I will keep on my shelves and share with my children.